Midwest Book Review and Kirkus post raving reviews. 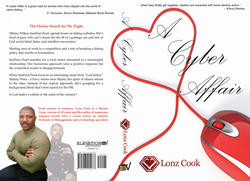 Elevation Book Publishing presents the new book, A Cyber Affair by Lonz Cook to market with a planned release on June 28, 2016. A Cyber Affair tells the story of success and pitfalls of online dating. “Anyone who’s been on a bad date will nod in recognition as Tiffany suffers through one man’s long-winded tales of travels abroad.” Kirkus Review. “A Cyber Affair is a good read for women who have dipped into the world of cyber-dating and online relationships, only to find their ideals thwarted by inconsistencies and illusions.” D. Donovan, Senior Editor, Midwest Review. During May 2016, Elevation Book Publishing is giving 25 ARC/Galley books to perspective readers via Goodreads (https://www.goodreads.com/giveaway/show/186149). In June, Elevation is sponsoring an Instagram contest where readers post a photo purchasing A Cyber Affair and become eligible to win an autographed framed poster of the book cover. A Cyber Affair’s National Book Tour begins at the time of release. Pre-Sales are accepted at Barnes and Noble. Lonz Cook is known for his Contemporary Romance Series Good Guys Finish Last (Book 1), When Love Evolves (Book 2) and releasing in late 2016, Against Conventional Expectations (Book 3). His novel A Choice to Yield is a Motion Picture of the same title. Contact Lonz Cook online: http://www.lonzcook.net. Elevation Book Publishing, dedicated partners who agreed to create a unique relationship with writers to elevate their creation to best seller levels. Elevation Book Publishing is open for submissions; Genres: Fiction – Drama, Contemporary Romance and Self-Help. Visit http://www.elevationbookpublishing.com for more information.